Privately bound book containing 25 scientific articles by Rudolf Höber on various topics related to cellular physiology, 1904-1913. I don’t know what happened to my grandfather’s scientific papers. I have tons of family papers, but for some reason they don’t include most of Rudolf Höber’s professional writings beyond his books. A posthumous article says he published over 200 articles in his lifetime, but for a long time I only had a few of them. Rudolf, a physiologist, published his first article in 1898 arising out of his doctoral dissertation, Observations on Experimental Shock through Stimulation of Serous Membranes. Thereafter, he would go on to publish three to six articles a year for the next 50 years. Whenever Rudolf published a new article, he would get a good number of extra copies, or “offprints,” that he would mail to colleagues around the world with whom he wished to share his research. 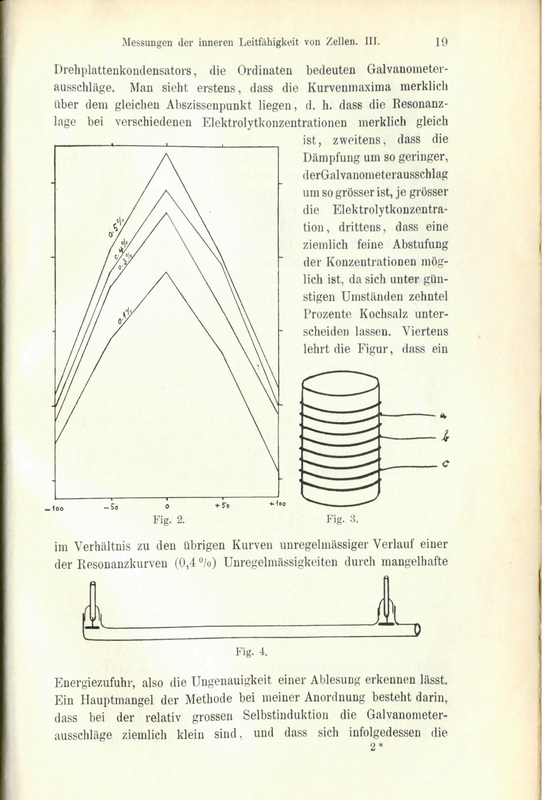 Page of an article on “Measurements of the Internal Conductivity of Cells” by Rudolf Höber, Bonn, 1913. For years, Rudolf sent copies of his articles to his friend Max Cremer, professor of physiology at the Royal Veterinary Technical Institute in Berlin. 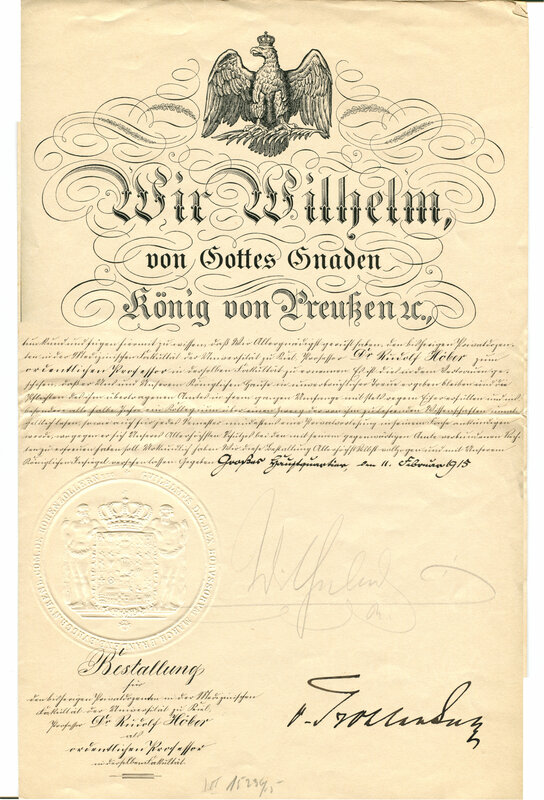 He wrote greetings on the cover, such as, “Sent with the sincere thanks of the author,” or, “With best wishes from R.H.” By 1913, Cremer had received 25 articles from Rudolf, making quite a nice stack, and he decided to have them bound by a local stationer and bookbinder, Adolf Liese. 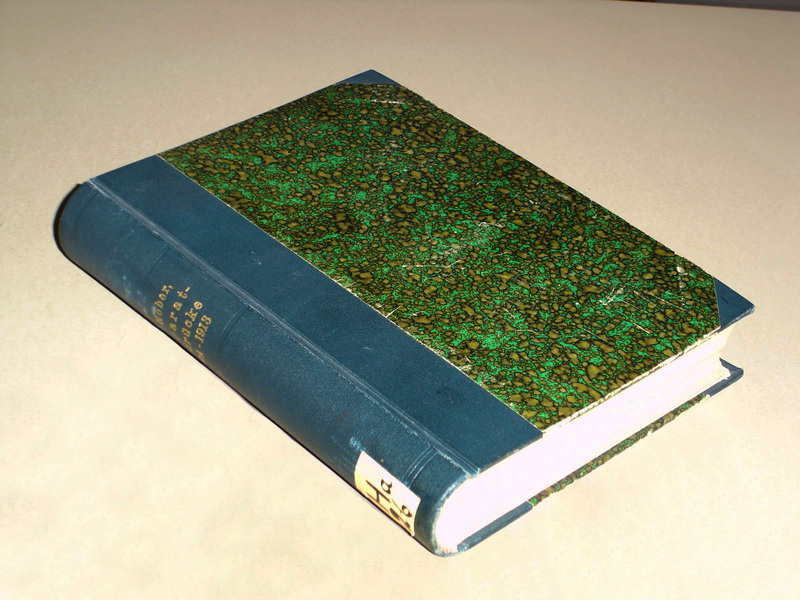 Herr Liese and Prof. Cremer selected boards with green and black marbling for the front and back covers, and dark green buckram for the spine. 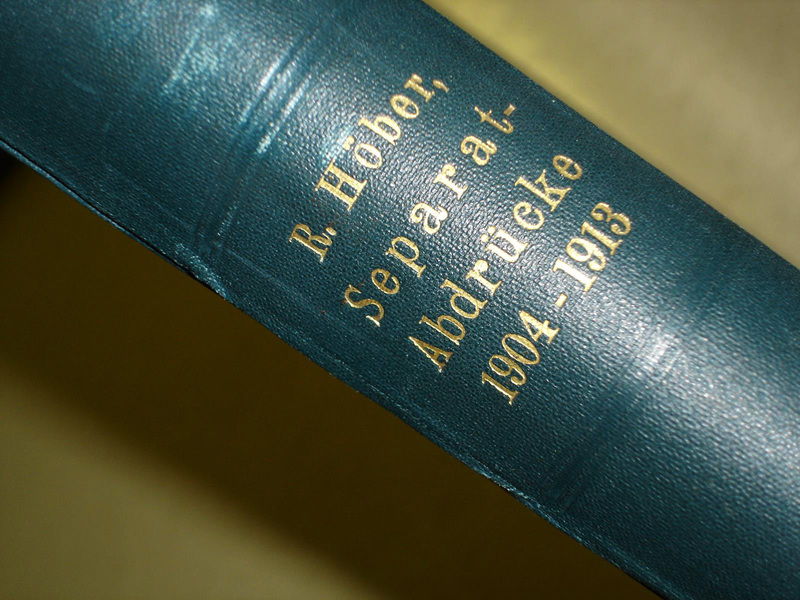 On Cremer’s instructions, Liese added gold lettering to the spine reading R. Höber, Separat-Abdrücke [Offprints], 1904-1913. When Cremer got the newly bound volume home, he stamped his own identification on the flyleaf: Dr. med. Max Cremer, Professor für Physiologie an der Kgl. Tierartzlichen Hochschule, Berlin. 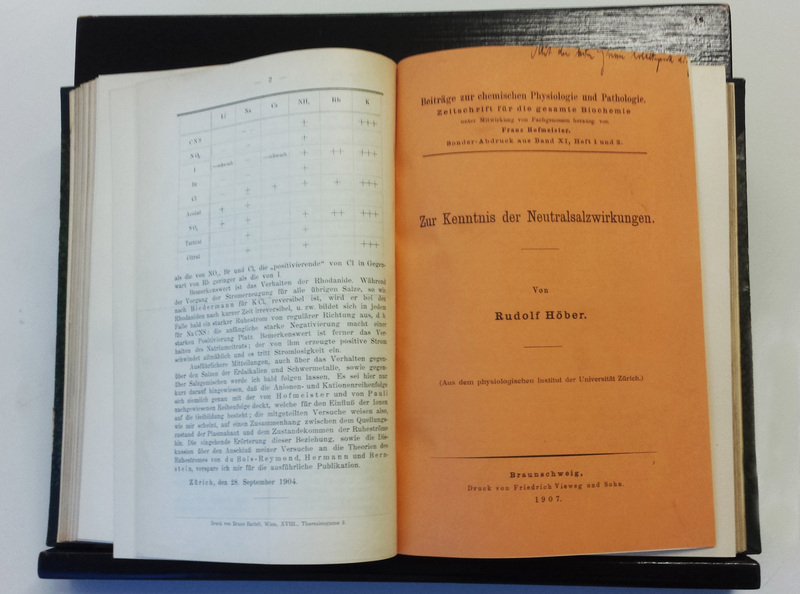 After Prof. Cremer’s death in a Nazi-dominated Germany in 1935, the volume made its way into the library of the Institute for Veterinary Physiology at Humboldt University in Berlin. A librarian dutifully added the library’s stamp to the flyleaf . A library label was glued to the spine and it was shelved with the other scientific books in the library. And there it stayed for another 50 years. Labels in Prof. Cremer’s bound copy of Rudolf Höber’s articles: stamp of Adolf Liese, stationer and bookbinder; stamp of Prof. Max Cremer; stamp of the library of the Institute for Veterinary Physiology, Humboldt Univrsity, Berlin. After the fall of the Berlin Wall in 1989, Humboldt University, in previously-Communist East Berlin, experienced a crash modernization effort, as the government of a reunited Germany moved the locus of the nation to the historic capitol of Berlin. As modern text books and research materials flooded into Humboldt’s library, tens of thousands of outdated and obsolete volumes were deaccessioned. One of the books deaccessioned was Cremer’s volume of Rudolf Höber’s articles. The University library added an additional stamp, “ausgeschieden”, or “deaccessioned,” and sent the book off to a huge outlet in Leipzig that had been the Communist government’s principal depository for used books for decades before the fall of the Wall. There it would sit until someone, anyone, showed an interest in buying it. I am in the habit of checking out used book websites to see what’s around. One night, I typed in Rudolf’s name. As I had come to expect, dozens of copies of his two books, in several languages, popped up on the site. But at the end of the very long list, this item caught my eye: R. Höber, Konvolut von 25 Sonderabdr. z. Physiologie, Zentralantiquariat Leipzig [“A Collection of 25 Offprint Copies on the Subject of Physiology,” Central Used Book Depository, Leipzig]. A few keystrokes, a credit card number, and 36 Euros later, and the book was on its way to me, perhaps the one person in the entire world who wanted it most. 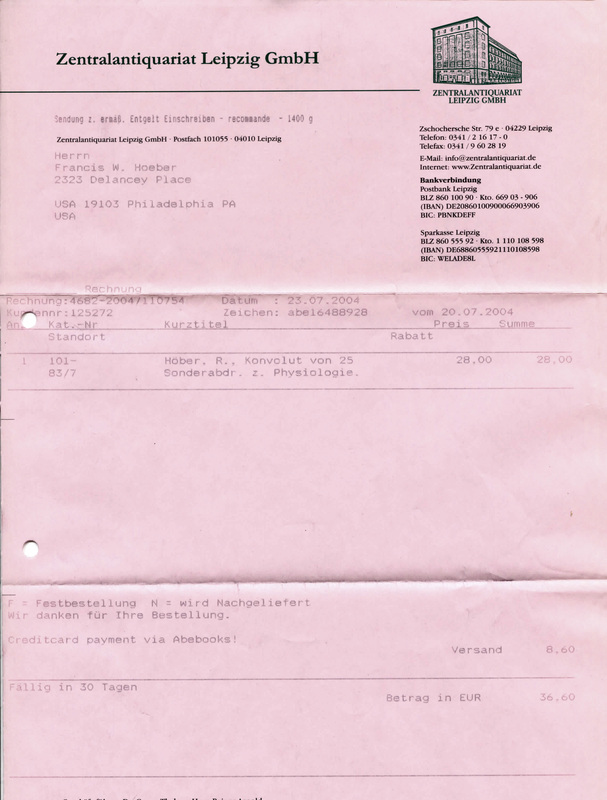 Invoice from the Central Used Book Depository (Zentralantiquariat) in Leipzig. 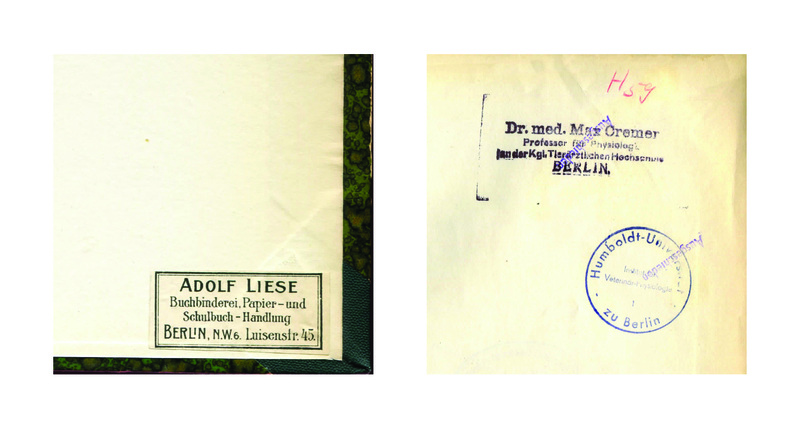 It was a revelation to open the package from Leipzig, the see the stamps inside the cover, and then to see my grandfather’s distinctive handwriting on each article, bold but delicate, that has become so familiar to me as I have worked with his papers. And when I read Mit den besten Grüssen vom Verfasser – “With the best wishes of the author” – I fancied for a brief moment that he had addressed those words to me, and that it was he who had sent me this volume from across the Atlantic and over a century in time. When the Nazis took over Germany in 1933, one of their first acts was to fire thousands of the nation’s most brilliant scientists and academics from their university positions, either because they were Jewish or because they were deemed “politically unreliable.” Those expelled included Albert Einstein, Martin Buber, Paul Tillich, Edward Teller and countless others. 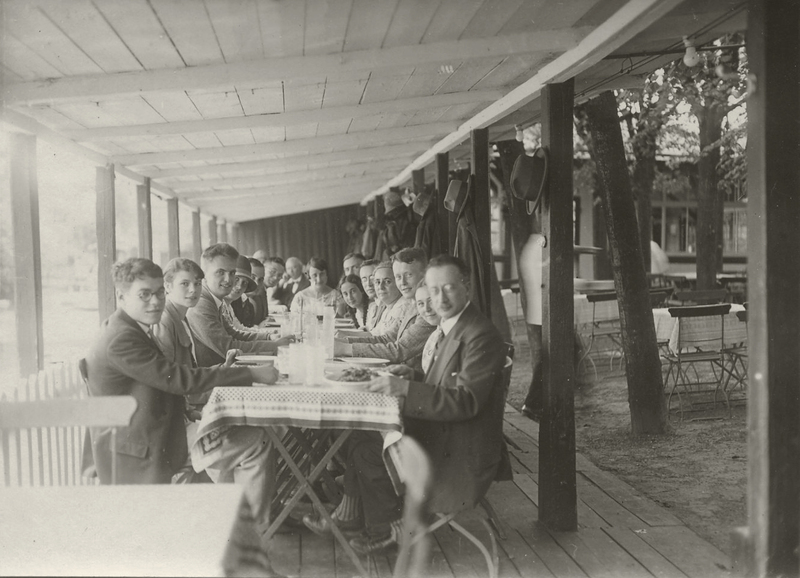 My grandfather, Rudolf Höber, a professor of physiology at the University of Kiel, was also one of them. I previously wrote about his last months at Kiel here. All of these fired individuals faced the difficult problem of finding a new place to teach and continue their research. 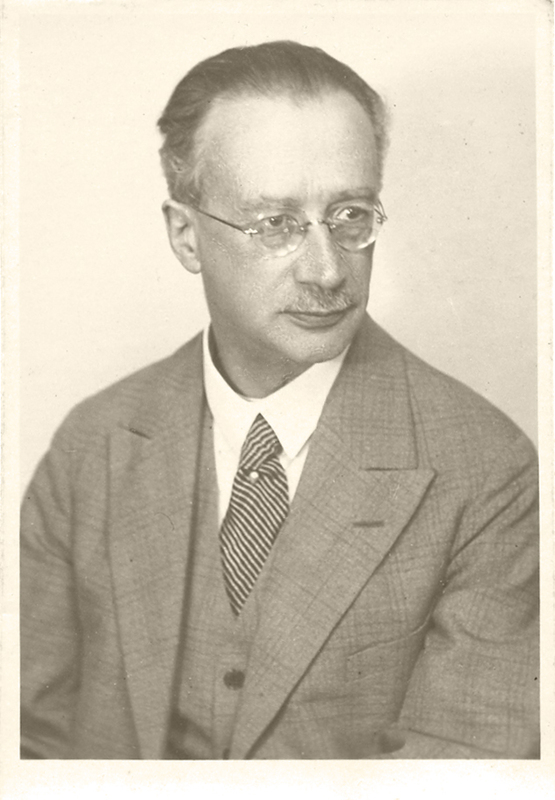 Rudolf Höber, Professor of Physiology, University of Kiel, around the time of his expulsion in 1934. 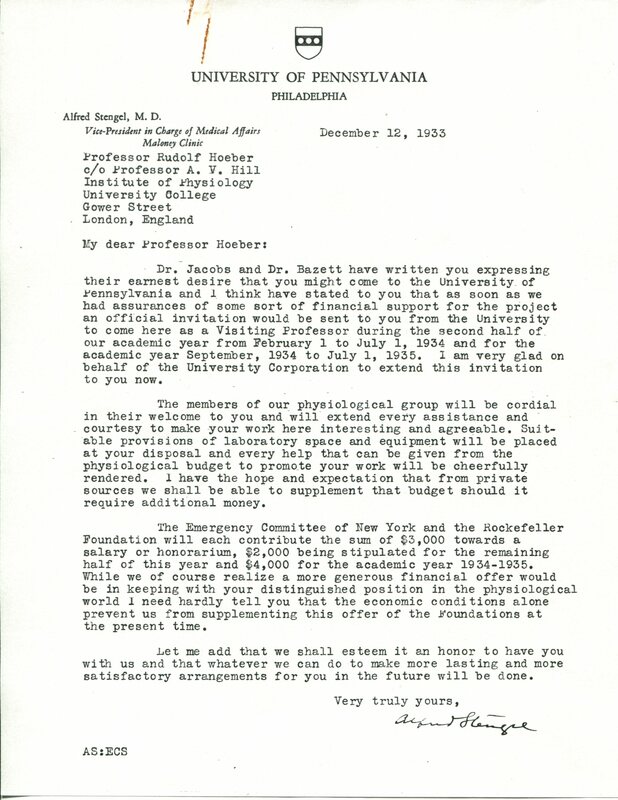 University of Pennsylvania’s appointment of Rudolf Höber as Visiting Professor, December 12, 1933. Upon his arrival in the United States, Rudolf wrote to Murrow and expressed his appreciation for the work of the Emergency Committee in finding a place for him to continue his work in America. Murrow responded cordially. 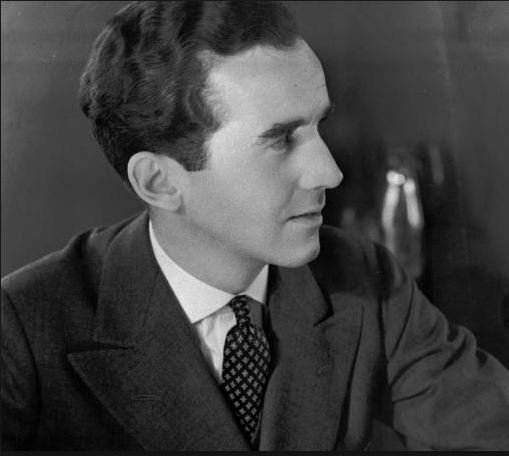 Edward R. Murrow around the time he ran the Emergency Committee in Aid of Displaced German Scholars, 1933-35. 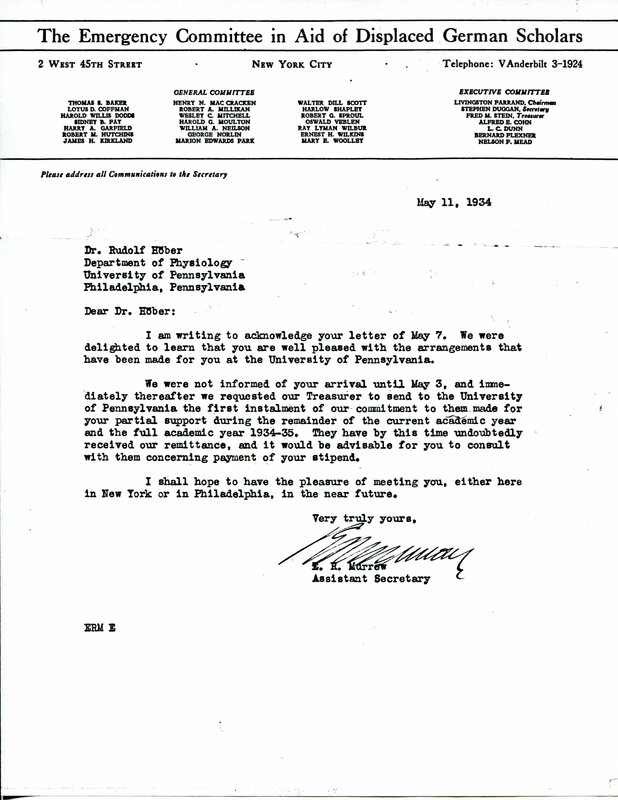 Edward R. Murrow’s letter acknowledging Rudolf Höber’s placement at the University of Pennsylvania, May 12, 1934. Within a few months of receiving the offer from the University of Pennsylvania, Rudolf and his wife, Josephine, were on their way to America. 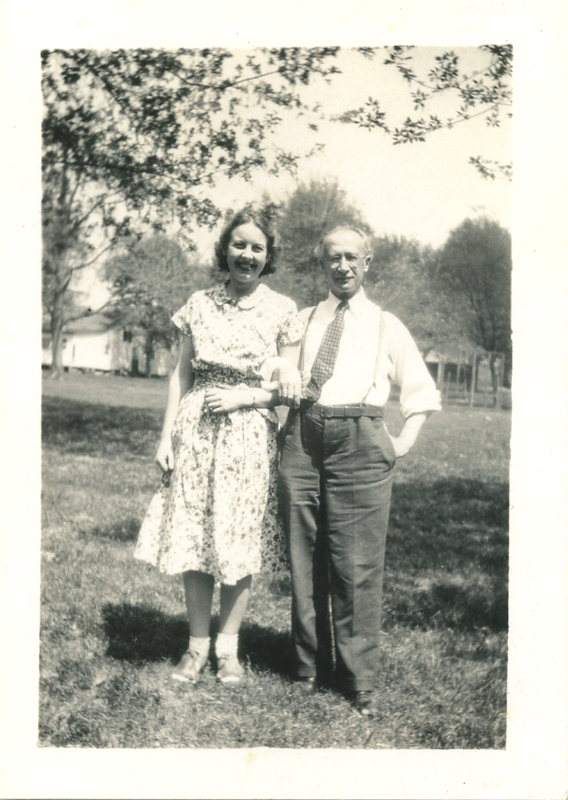 They had escaped the Nazis and would live and work in Philadelphia for the rest of their lives. 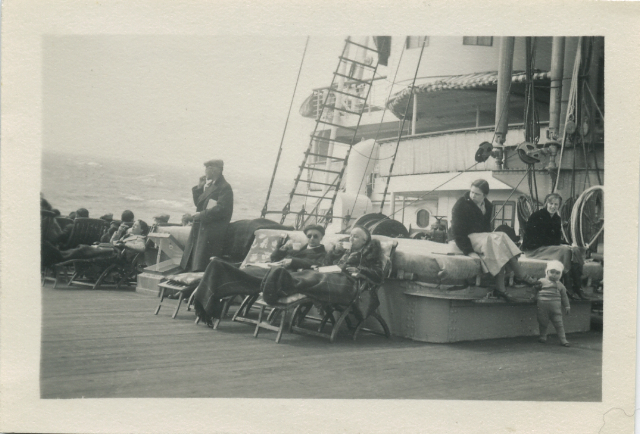 Rudolf and Josephine Höber on the boat to the United States, May 1934. Both were workaholics, so their relaxed pose in this picture is totally uncharacteristic . Rudolf Höber (1873-1952). Picture taken around the time he served as Chancellor of the University of Kiel. My grandfather, Rudolf Höber, was a gentle soul. Although he was a hard-driving, extremely serious scientist, he was much beloved by his students in the Physiological Institute at the University of Kiel, in northern Germany. They admired his sweet disposition and his passion for the exquisite objects of study in the world of natural science. But my Opa Rudi could also be a fighter when someone tried to interfere with teaching or research. In 1930, three years before Hitler took over Germany, Rudolf Höber served a term as Chancellor of the University of Kiel. In October of that year, a group of Nazi students tried to prevent liberal theologian Otto Baumgarten from lecturing at Kiel because he was a “pacifist” and “Jew-lover.” Rudolf expelled the Nazi ringleaders from the University for their interference with academic freedom. These expulsions led to nationwide demonstrations by right wing students calling for Rudolf’s ouster from from the University — but he persevered in his teaching. 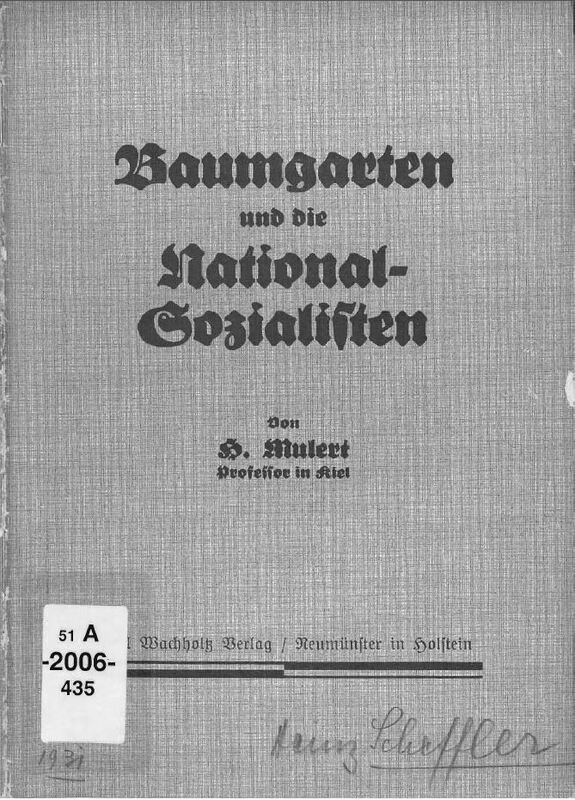 “Baumgarten and the National Socialists,” a report containing Rudolf Höber’s order expelling Nazi students from the University of Kiel, 1930. A little over two years after this incident, in January 1933, the Nazis took complete control of Germany. One of Hitler’s first assaults was against thousands of the most prominent professors at the country’s vast university system on the ground that they were either Jews or political opponents of the Nazis. Rudolf was one of the early targets of Hitler’s thugs. 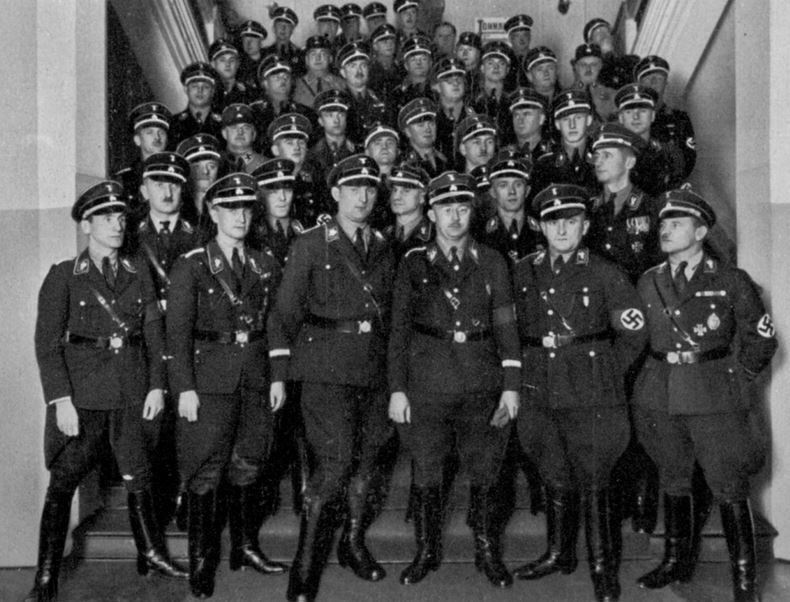 A group of Stormtroopers, Hitler’s jackbooted paramilitaries. They were also called Brownshirts because of their uniforms. In German they were known as the Sturmabteilung or SA. 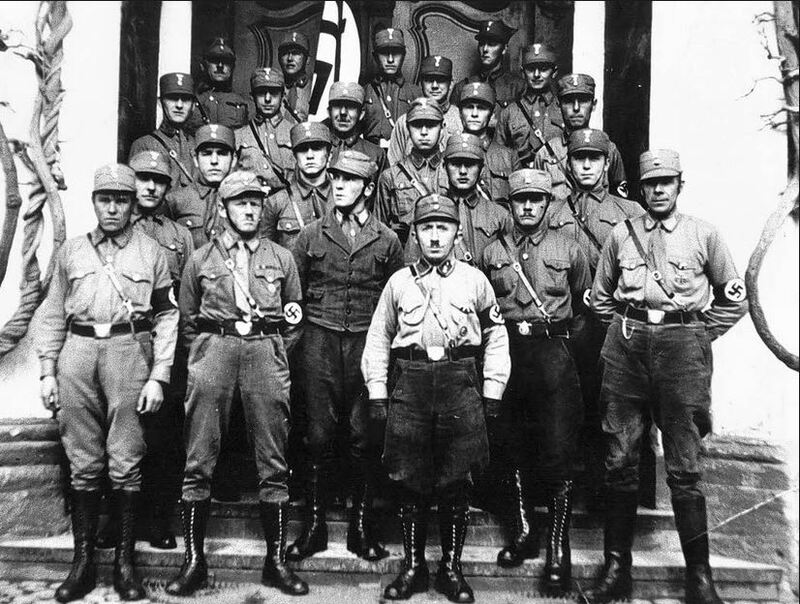 Troops of the SS or Schutzstafel. They were more disciplined and dangerous than the Stormtroopers of the SA. To His Excellency the Provost of the University of Kiel. In accordance with our discussion, I am submitting this report to you concerning the events of this morning. This morning, as chairman of the Examination Commission for the premedical examination, I was present in the Anatomy Building as proctor for a makeup examination. On my way home I was accosted on Hegewisch Street [where I live] by five SS and SA men and two civilians who told me in the coarsest possible terms that if I did not want to endanger my life I had to keep out of the classrooms and laboratories of the Institute and that I no longer had the right to administer examinations. They talked about the use of hand grenades, about the need to comply with their demands, about the use of force and things like that. When I replied that as chair [of the Examination Commission] I also had to participate in other examinations, I was forced to return to the Anatomy Building, escorted by the troops, in order to share the prohibition orally with Professor Benninghoff and the remaining four examinees in the remaining four institutes. In the Anatomy Building the people around Professor Benninghoff realized gradually that this oral announcement was meaningless, and therefore accompanied me to the Physiological Institute and left me at my residence. In the meantime, the following had taken place in the Institute: about 30 SS people filled the corridor. They accused Assistant Professor Dr. Netter of being a Jew; the same thing happened shortly after that with Professor Mond. In addition, they issued an order that these men were no longer allowed to administer any examinations either. I immediately notified Police Chief Count Rantzau by telephone, who promised me to pursue the matter and inform me of the result this afternoon. 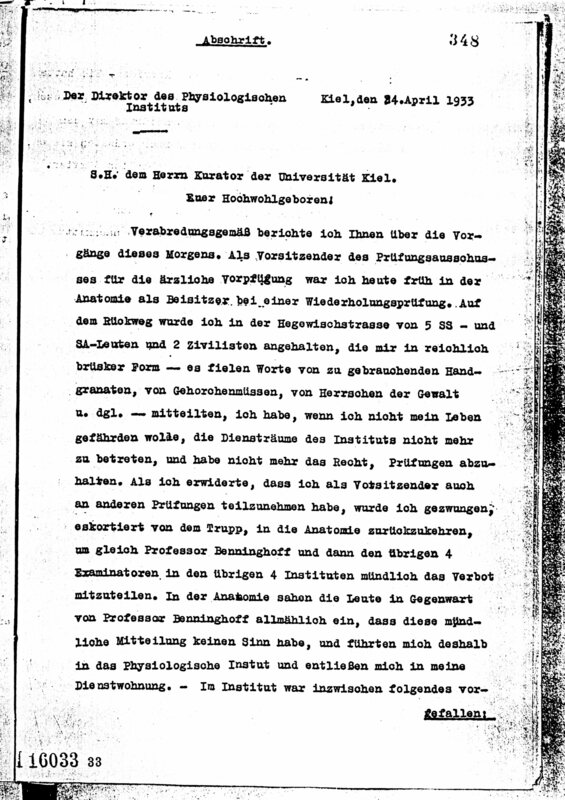 Copy of Rudolf Höber’s report to the Provost of the University of Kiel, April 24, 1933. 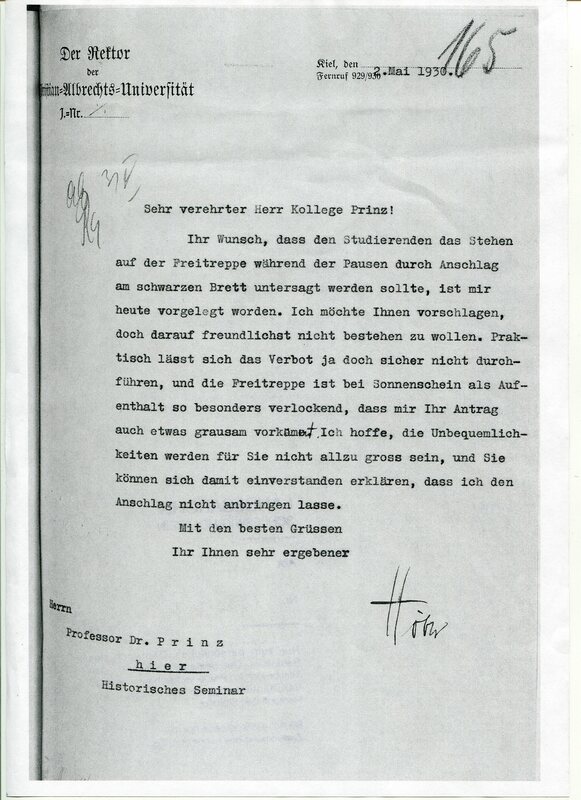 Obtained from Rudolf’s personnel file in the Prussian Secret State Archives in Berlin. There is no record of what action, if any Count Rantzau took, but Rudolf defied the threats of the SA and the SS and returned to his classroom and laboratory within a matter of days. He continued teaching for several months more, and his students loyally attended his lectures despite the threats. This situation couldn’t last, however, as the Nazis tightened their grip on the nation and the German people. 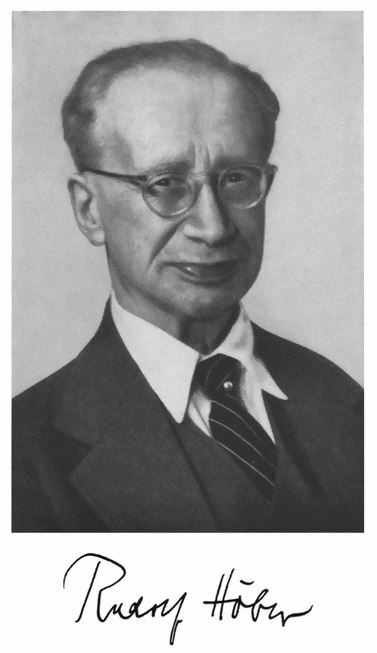 In November 1933, Rudolf was permanently dismissed from his professorship. Unable to continue his research and teaching in Germany, he, like so many other brilliant scientists, emigrated, first to England and then to the United States. 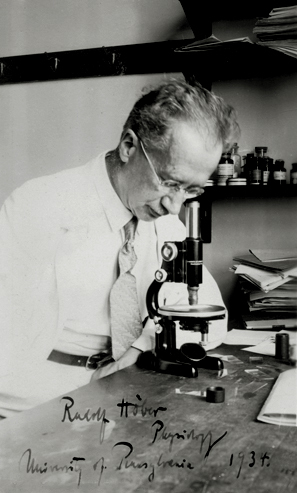 In 1934 he was appointed Professor at the University of Pennsylvania, where he continued his pioneering work in physiology until a few years before his death in 1952. After World War II and the defeat of the Nazis, the Physiological Institute at the University of Kiel was renamed the Rudolf Höber House and a street through the University campus still bears his name.